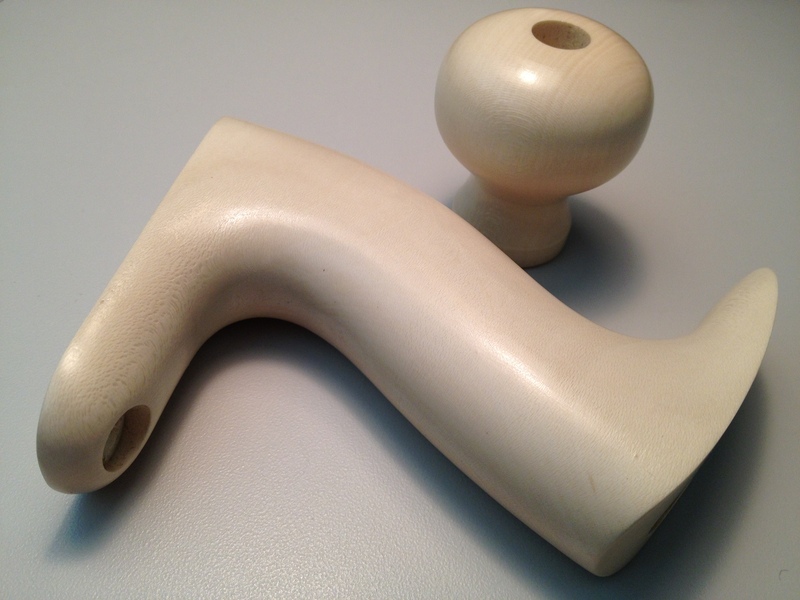 Bill Rittner (Hardware City Tools) recently made a knob and tote set out of holly for Catharine Kennedy (Custom Engraving by Catharine Kennedy). Bill had procured enough of the wood to make a second set. 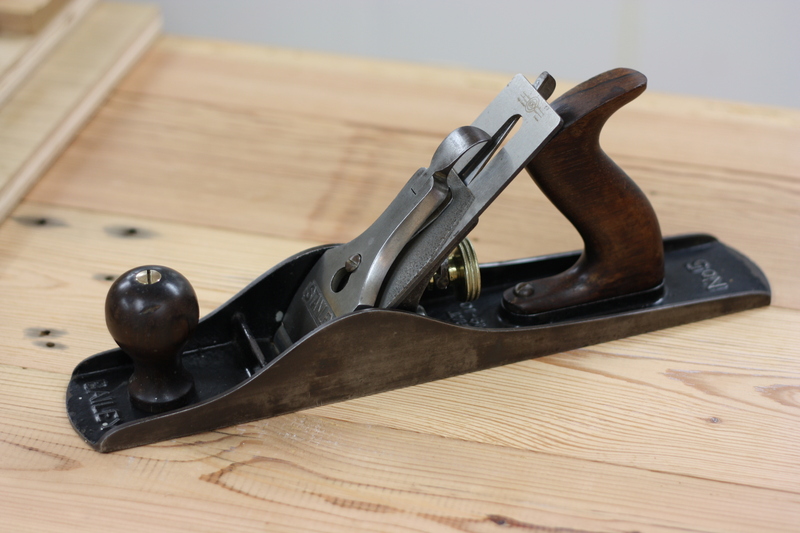 Being one who loves customized and personalized tools in my shop, I saw an opportunity to upgrade one of my planes with something pretty special, so I took a bit of money out of my woodworking funds and purchased it. The idea was to figure out what plane I wanted to put it on and then have Catharine do some engraving on it, as well. Unfortunately, for various reasons, I had trouble deciding what plane I wanted to upgrade. My go-to smoothing plane has a cracked cheek that might not do well with being engraved on, my jointer plane would be quite costly to engrave and might be a bit heavy for the holly tote (not really sure about that, but I’d rather not take the chance), and my #5, a Type 18, isn’t really a favorite of mine, though it does its job well and I haven’t found the need to replace it. A few weeks ago, I was at an estate sale, where I happened upon an old #5c that seemed to be in good shape. 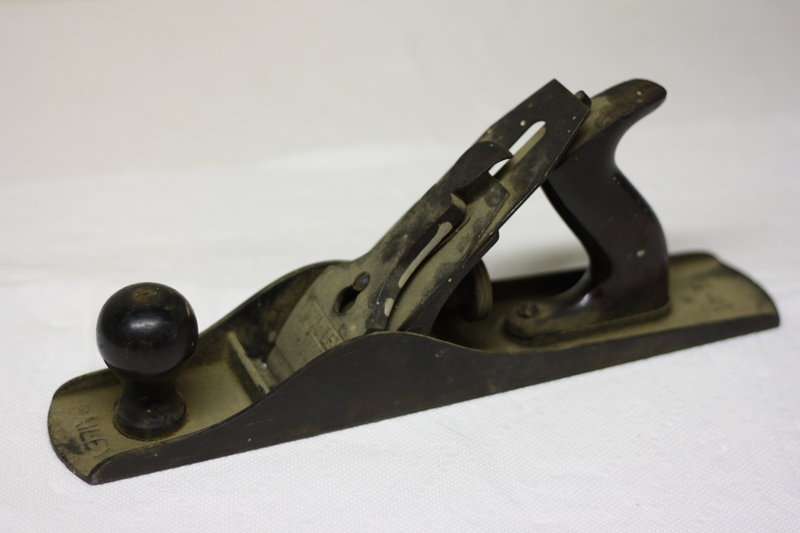 I didn’t have any need for another jack plane, but they only wanted $5 for the thing, so I figured at the least I could buy it and hand it over to a needy member of the St. Louis Woodworkers Guild who was just starting to get into hand tools. As I was once again going through my planes last night (I don’t have that many, so it doesn’t take long), my eyes rested on the new #5c. I picked it up, wondering if I might not get rid of it. A quick glance at the Woodnet Stanley Type flow chart confirmed what I’d originally thought – it was a Type 13. But after examining it more closely, I noted something odd. It was pretty much completely rust-free! 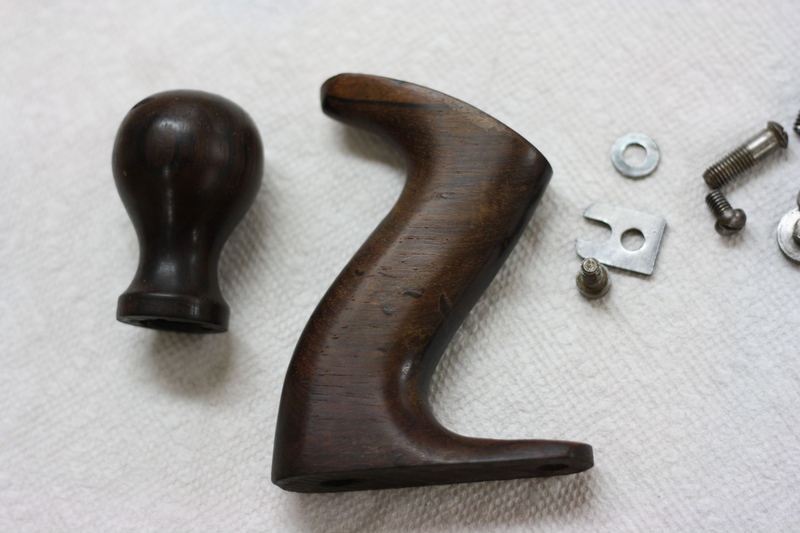 It did have an interesting bronze-like patina to it and the dust left on it from years of sitting idle seemed to be caked on, somehow, but the only rust I found after dis-assembly was on the post inside the knob. 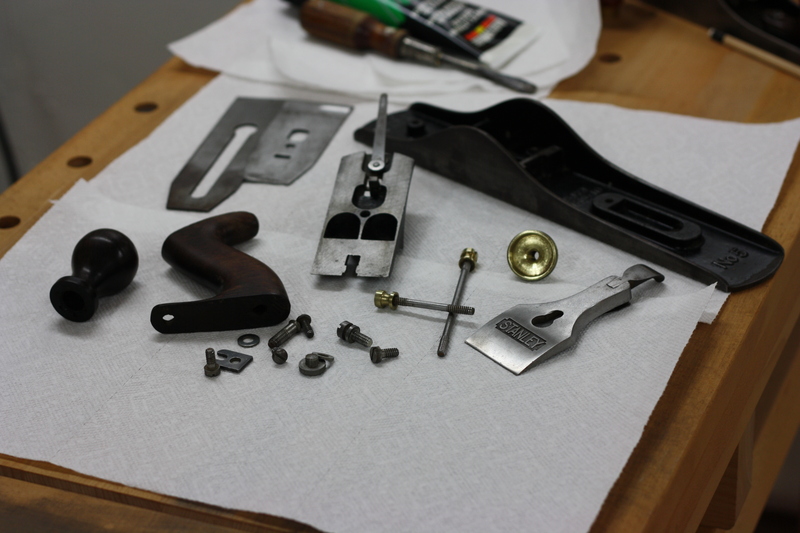 That settled it; I pulled out the restoration tools and some blue gloves and went to work. 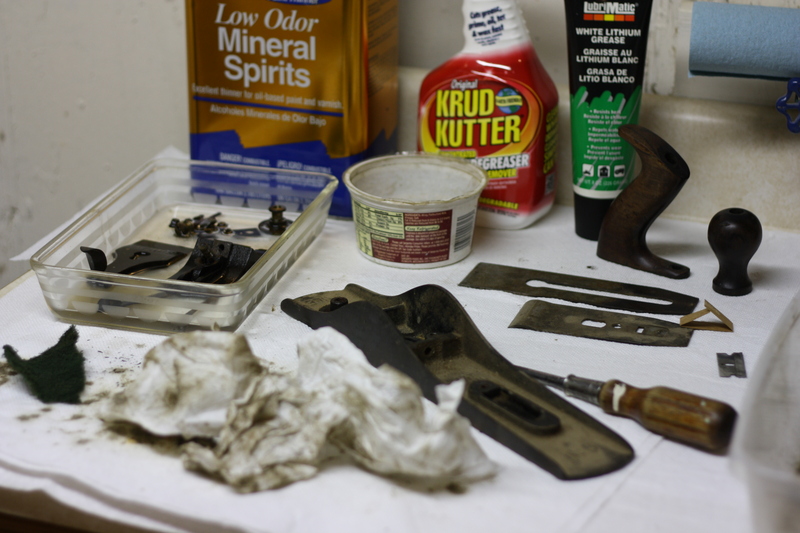 All of the small parts soaked in low-odor mineral spirits while I cleaned up the body. 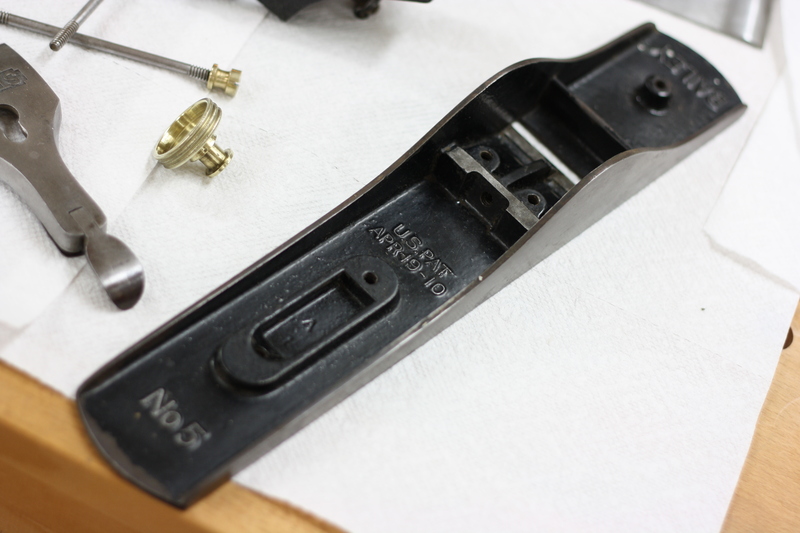 The mineral spirits helped, but I didn’t see really good results until I started using an orange-based degreaser, which made me wonder if the plane hadn’t been coated with some sort of rust-preventative 80 years earlier and then sat unused ever since. It has close to 95% of its japanning left, even on the frog. The tote has a little bit of sapwood on the horn, which always looks nice. I’ll hold on to these in case I need to replace them on a different plane in the future. I still need to clean up the bottom a little; it doesn’t need to be flattened, but I do want to remove some of the gunk so it doesn’t drag across the wood. Before I send it off to Catharine for engraving (I need to save up a bit first), I’ll clean up the sides a bit more to make sure she has a nice canvas to work off of. Here is the before again, followed by the after. I believe my old #5 just got replaced. That is ridiculous, the best $5 plane I’ve seen. It appears that you didn’t use the holly after all. Interesting how persnickety some people can be about the horn on the tote. Some of my favorite planes lost that little appendage years ago, and they seem to fit my hand better. No, no, I’m going to use the holly on this plane. I’m just not going to put the new set on until I have the plane completely done is all. Still need to clean up the bottom a bit and prep the sides. Plus, I wanted a good before and after shot where it had all of the original parts (though I later noticed I’d forgotten to put the old blade back in after I gave it a test drive). For years, I have gone to the collector shows to buy tools. 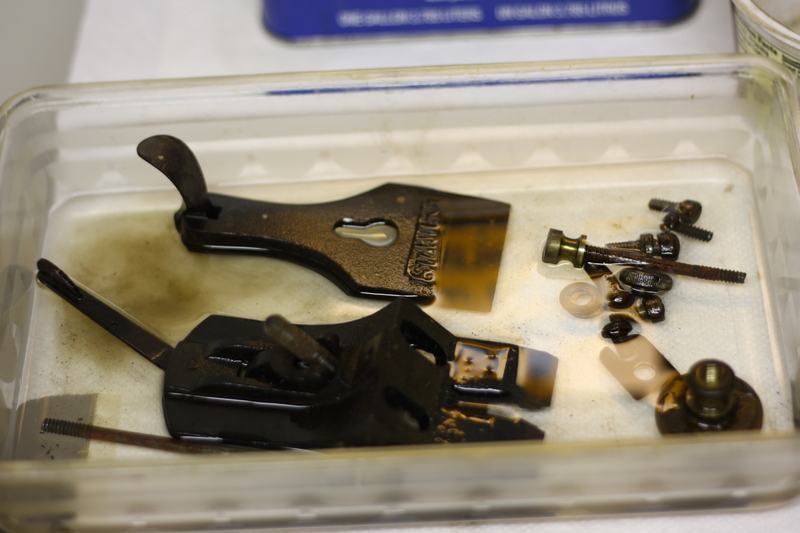 They are all obsessed by brand and condition, but rarely, if ever, actually use tools. What’s weird, fewer people show every year. Prices drop, less money circulates, and the collectors never make the connection. They’re still looking for that #1 in mint condition to complete the set. For the most part, I don’t collect tools. I don’t want a full set of Bedrocks and a full set of Type 11s (sorry, Sistek, but it’s the best example I can think of). 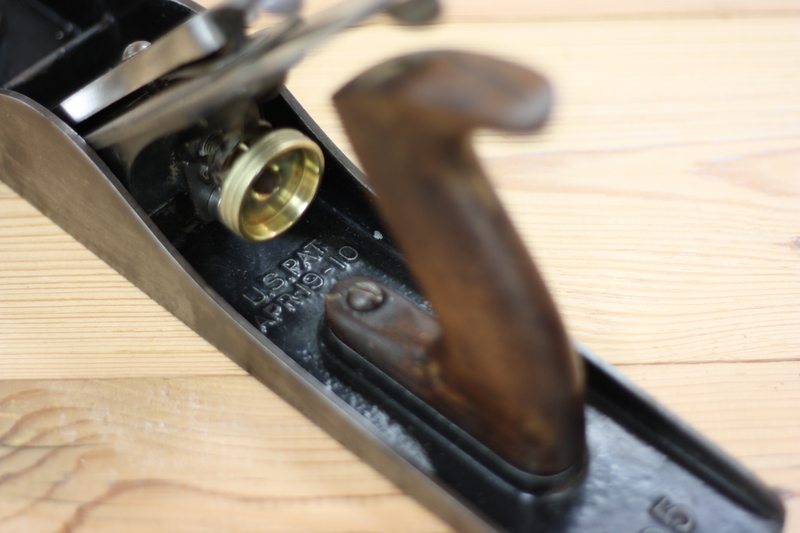 I have a smoother and a jointer and now one too many Jack planes (so one has to go). I have about seven or eight hand saws right now, but that’s because I’m in the process of figuring out what works best and feels best in my hands. Once I know that, I’ll dump the ones I don’t want for what I paid for them. I probably wouldn’t go to a tool collector show to buy tools; the price is going to be higher than I’d rather pay. I go to estate sales, especially when they don’t list tools or they have a vague description of them, because that’s where you’ll find the bargains. 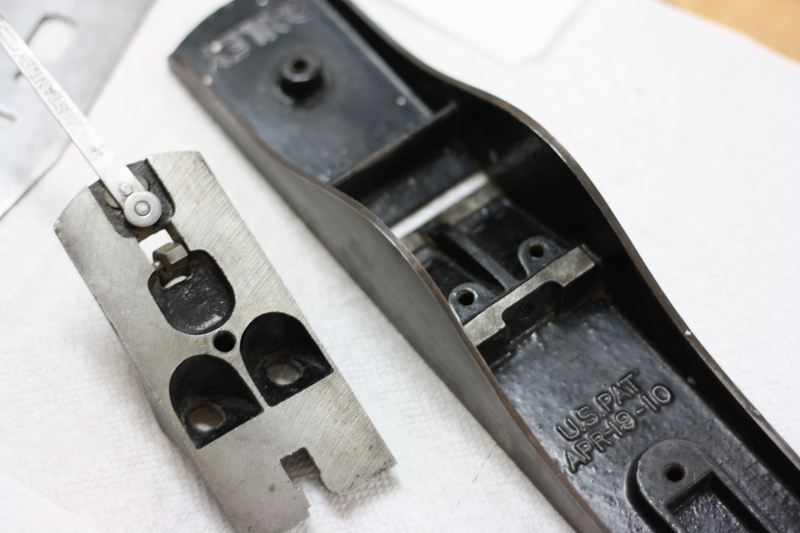 I occasionally buy from Patrick Leach or Josh Clark, but those are going to be hard-to-find beading tools (the one thing I collect) or things I don’t readily find in my area, like moulding planes. I have been acquiring tools for about thirty years, many of them given to me, some inherited, the rest from flea markets and antique shops. 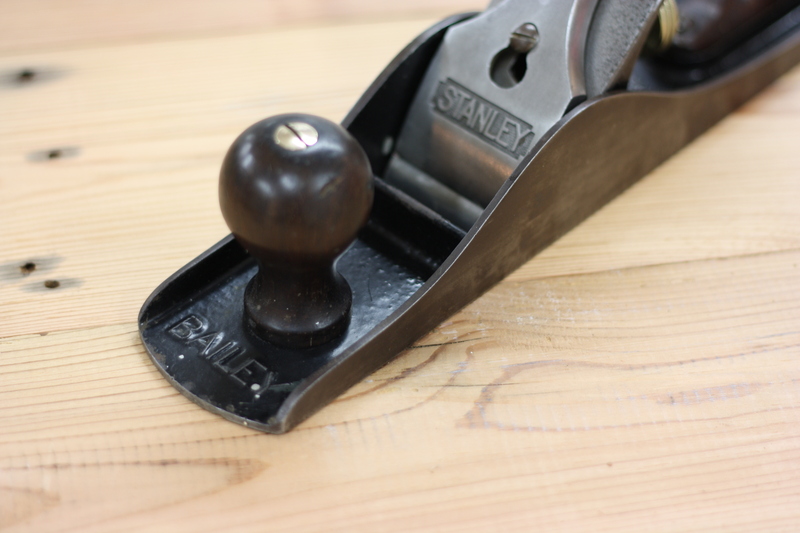 My favorites planes are the ones I made, and the old English chisels are just awesome to work with. 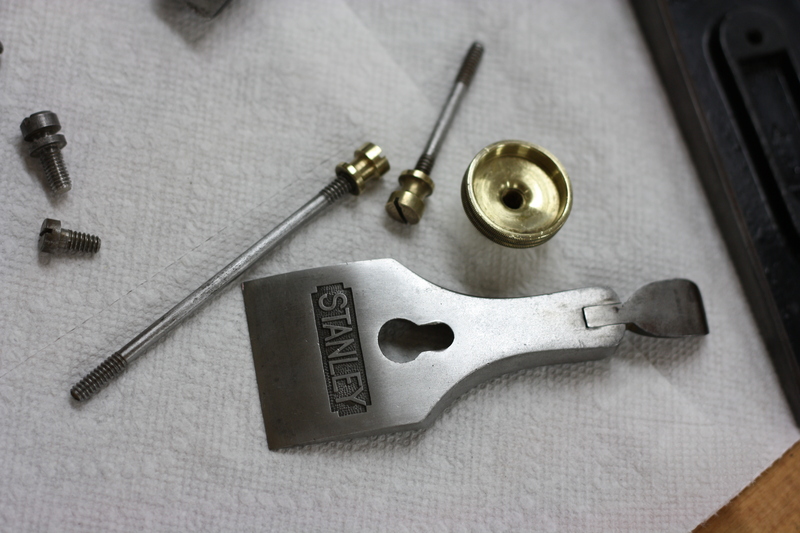 Often, tools have been abused, through carelessness or ignorance, and need a bit of a scrub and a sharp edge. I don’t care much for Leach, or snobbery or luminaries in general. The woodworking magazines have become more about pushing product than any coherent philosophy of work. This is the only way I have any broad contact with anyone. ADHD, OCD. Pick an acronym…any acronym will do. WOW what a gem ! That is practically a new plane. Indeed! Time to put it to work finally!